You wouldn’t expect a whole lot a laughs from a show where you’re repeatedly told that you’re going to die, but Stuart Bowden has done just that with She Was Probably Not A Robot. In this darkly hilarious and utterly charming show, Bowden has crafted an absolute winner. She Was Probably Not A Robot is a post-apocalyptic tale of one man’s baffling survival and a love so strong it’s very much creepy. Though this is a one-man play, Bowden portrays two characters – himself and an adorable alien lifeform that just likes to make stuff. The story is beautifully absurd and drifts off onto some delightful tangents, Bowden gleefully repeating and expanding upon moments that get the audience laughing. As a storyteller, Bowden is endearing and untrustworthy, like a small child spinning a tall tale. Everything he does has an excitable energy – and boy, does he have a lot of energy. Bowden is a very physical performer, at times literally throwing himself across the stage. Bowden is adept at creating fully-realised worlds from very little. Small mimed flourishes, such as remembering to release the brake on a pram before pushing it, make everything seem that bit more real. 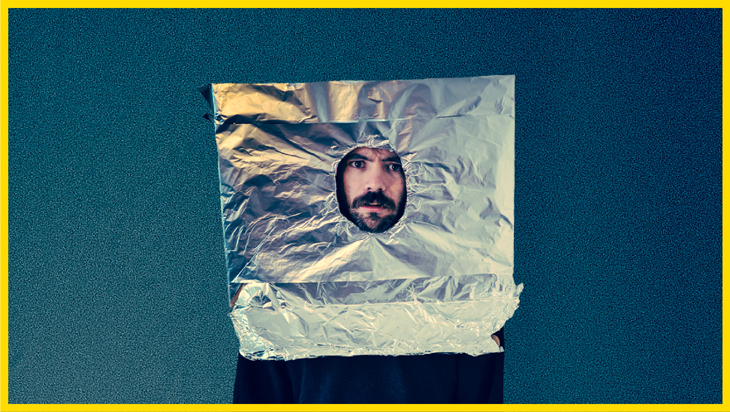 The few props in the show have a very home-made feel about them – from Celeste the Alien’s tin-foil helmet, to a bed sheet that still had its green Savers price tag attached to it. The musical aspects of the show were very successful. Bowden’s singing added a layer of vulnerability to his performance, and a sing-a-long at the start quickly brought the audience together, preparing them for what was to come. Bowden’s use of loop pedals to build up his melodies was beautiful, but also allowed for some wonderful comedic moments as he bounded across the stage to stop and start various tracks. She Was Probably Not A Robot has got to be one of the most joy-inducing stories about the death of (almost) all humanity there is. If you like your comedy on the silly side (and who doesn’t, really? ), it’s well worth adding to your festival list. Stuart Bowden – She Was Probably Not A Robot is on at the Malthouse Theatre until April 17.